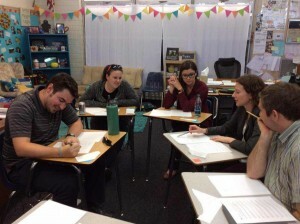 High School Teacher Training Workshop Held at Local High School! 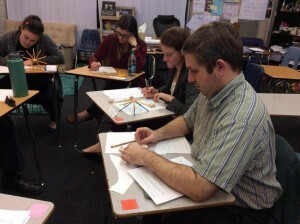 Dec. 5, 2016, Areteem Institute held a math teacher training workshop, which is one of a series of professional development sessions we are conducting at the Southlands Christian School in southern California. Five high school math teachers participated in the two hour workshop covering the topic of “How to Effectively Teach Algebra Problem Solving”. We presented hands-on activities to demonstrate interesting ways to visualize abstract algebra concepts. We talked about engaging students with various problem solving techniques to stimulate critical thinking and how by using a variety of approaches requiring certain knowledge points, students can be engaged even though they may be at different academic levels. We are delighted to report that the teachers enjoyed the training very much. They are happy that the professional development is relevant to them, and they can use the techniques in their classes. We look forward to hosting more workshops with them throughout the year. Are you interested in teacher training in mathematics? Then Areteem Institute can come to your school too! For more information, please contact us in our main office located in Irvine, CA to speak with our staff on how we can bring our innovative workshops to you. With our years of training and academic expertise, our curriculum specialists and instructors will equip your teachers with the skills that will help propel their students to succeed in their math classes. We can tailor the workshops to suit all levels for elementary school, middle school and high school math teachers! 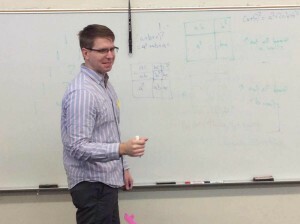 Here are some pictures taken during the workshop on Dec 5th with the Southlands math teachers engaged in hands-on activities and lessons led by John Lensmire, Areteem Institute’s Curriculum and Instructions Director. ← Jet Propulsion Laboratory’s 80th Anniversary and the Women of STEM- NASA’s first Computer Programmers!